Exercise and Smart food choices! It is always interesting to see how people sabotage all of their incredible efforts in the gym or in most fitness programs. They do workouts in the gym or go for a run or any kind of exercise and they are really putting in a lot of effort to build and keep their body fit. This is a fantastic first step but this is just the beginning. Because as soon they leave the place or finish the run, they go straight to any food place and end up overeating junk food and under-eating nutrient-rich food. It is like buying a car but do not give the correct gas to drive. Your car will just stop to serve you and not functioning any longer. I understand that after 1 to 2 hours of any fitness programs – we ARE hungry. Of course we are because our body (luckily) burnt a lot of calories. This is ONE of the reasons why many people go for exercise or go for a run. Right! Here comes the point where you want to learn to be smart as this will make a huge difference in your fitness level and also on your long-term health benefit. So think about this: the body burns calories during any exercise program that you are doing and this is exactly what we want. However we DO NOT want to eat any kind of meal (fast food, processed food or convenient food) immediately after each exercise as it will destroy the hard work that we have put in to burn off those calories during the exercise. Actually it does more harm than good. The body needs smart food like vitamins, minerals, fiber and PROTEIN, not only after exercise but especially after exercise. Our diet is very important (see at the bottom of this Blog how Wikipedia defines Diet). So exercise with a smart diet will give you the best result. If you commit to a diet of clean food – mainly all colors of plants, lean quality proteins, good healthy fats and limit processed food, fast food, sugar, simple carbohydrate and trans fats, you can see tremendous results in your body. And it is a great booster for your exercise and fitness program. An easy and great way to reduce your nutrition deficiency is to supplement your daily nutrition with our Healthy Nutrition Supplement Breakfast which delivers all the necessary vitamins, minerals and protein. 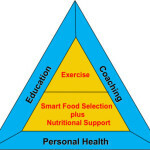 Do you agree that exercise and smart food selection is important? Share now! This will not only enhance your fitness and exercise regime but also greatly enhance your daily energy level and support a healthy long lasting lifestyle. Join us now by submitting your details to learn more how to combine exercise with a great Diet. Click here. Learn what’s so easy to do but most don’t do because they don’t know! We teach our clients about food and educate them how they can do better and smarter food selections especially after their exercise. Our clients also get to understand the impact of the food and the importance of a better food combination for their life. Proper nutrition requires ingestion and absorption of fiber, vitamins, minerals, and food energy in the form of carbohydrates, proteins, vegetable oils, and fats. Dietary habits and choices play a significant role in the quality of life, health and longevity. Previous Post: How to monetize as Personal Trainer?